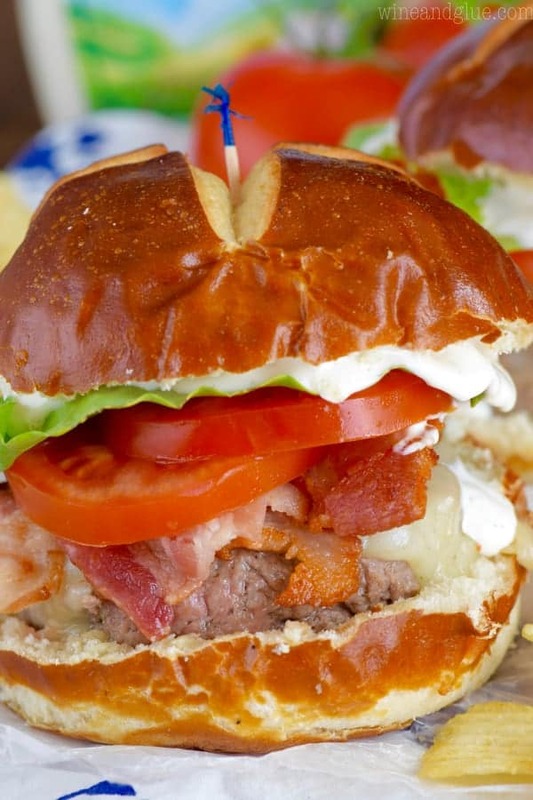 These BLT Ranch Burgers are ridiculously simple to make, but so packed with flavor and so good! I’m so happy to be partnering with Hidden Valley® to bring you this amazing burger! You guys! Are you getting excited about summer?? It’s so close I can taste it. And the fact that it SNOWED in April has only made me more eager for its arrival. With summer comes so many fun chances to have family and friends over. Graduation parties, celebrating Father’s Day, the Fourth of July . . . so many fun times! So my family and friends tend to love having burgers on the grill, but can I tell you a secret? Making burgers makes me nervous! Like how do you season them? How do you make sure they stay moist? 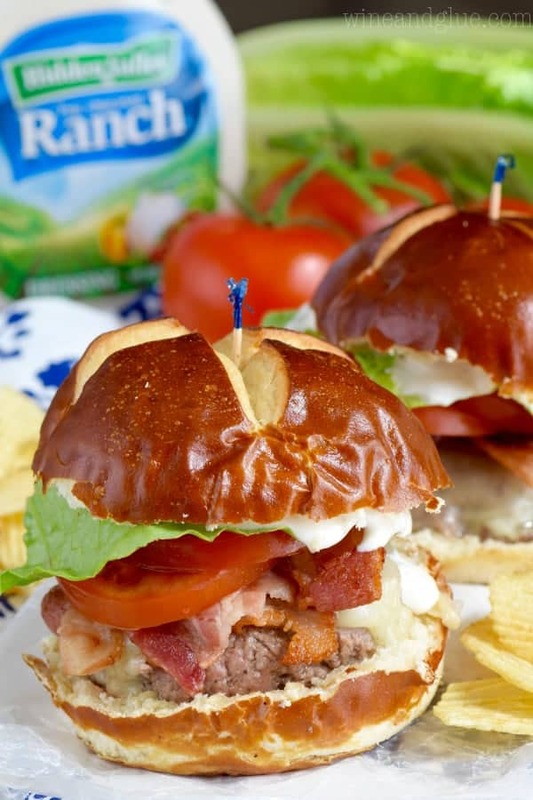 Problem solved peeps: BLT Ranch Burgers. These start and end with Hidden Valley® Original Ranch® and they are spectacular. 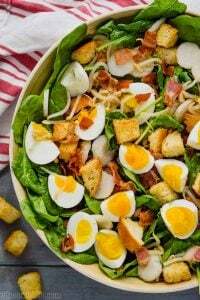 I love putting Hidden Valley® on my salads, I actually kind of panic when I run out of Light Hidden Valley® Original Ranch® Dressing (for real, it’s not pretty), but it’s good in and on so many things! Like these sliders or this pizza or OMG these potatoes. And now. Burgers! 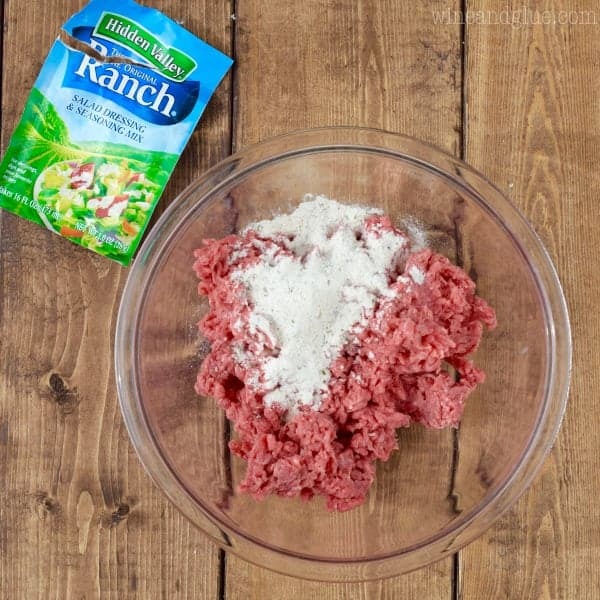 Start by adding a packet of Hidden Valley® Original Ranch® Salad Dressing & Seasoning Mix to 80% lean ground chuck. You are going to want one seasoning pack per pound of meat. You guys. Don’t skimp here. This is not the time to go for the 90%. Trust me. Mix it in well and then divide your meat into portions for burgers. You are aiming for about 4 ounce burgers. You can totally eyeball it but if you have a kitchen scale, I would weigh them. That way you don’t have to worry about some burgers getting done before others. You know? Form them into patties that are about 4 inches wide and give them a nice indentation in the middle. Now here is the fun part. You need some cooked bacon for this recipe. So you can go ahead and make the burgers in the pan that you made the bacon in and you get a nice little bacon taste right in your burgers. YUMMY! Or you can go ahead and throw them on the grill outside. Top them with some provolone cheese at the tail end of cooking. 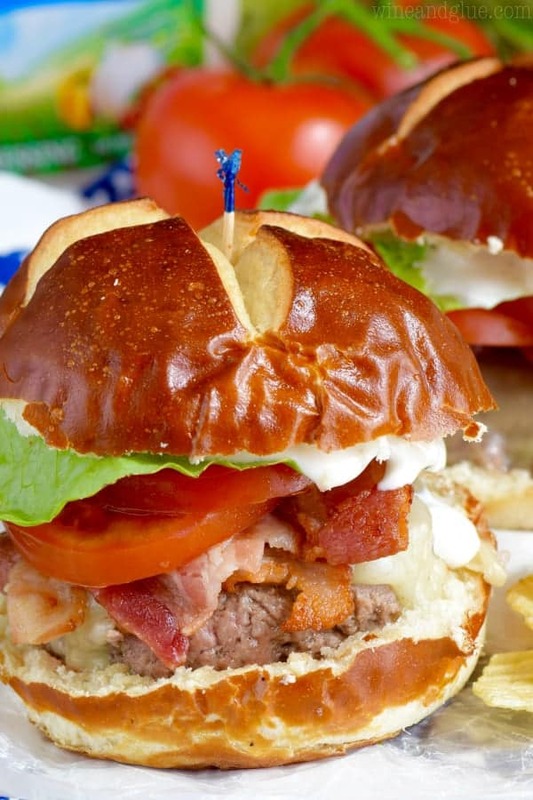 And then pile them high on pretzel buns with bacon, lettuce, tomato (they are BLT burgers after all) and finally some Hidden Valley® Original Ranch® Dressing. You guys these burgers. They turned out so amazing. So moist and so perfectly flavored. You are going to love them. For more great Hidden Valley® Original Ranch® recipes be sure to follow them on Facebook, Twitter, and Pinterest. Tell me your favorite non-salad way to use Hidden Valley® Original Ranch® Dressing for a chance to win a $100 Visa Gift Card. Links welcome! I’m always looking for new ranch recipes! Mix together the meat and the Hidden Valley® Original Ranch® Salad Dressing & Seasoning Mix until fully combined. 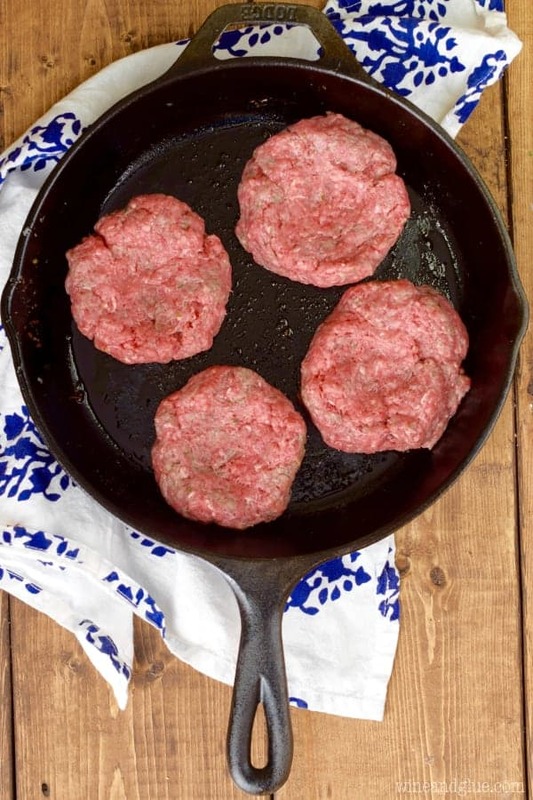 Divide the meat into four four ounce balls and form into patties, slightly indenting them in the middle. To cook in the skillet you made the bacon in, drain the skillet of the excess fat. Heat over medium heat. Add the patties and cook for about four minutes on each side. Once flipped, add the cheese at the tail end of cooking. 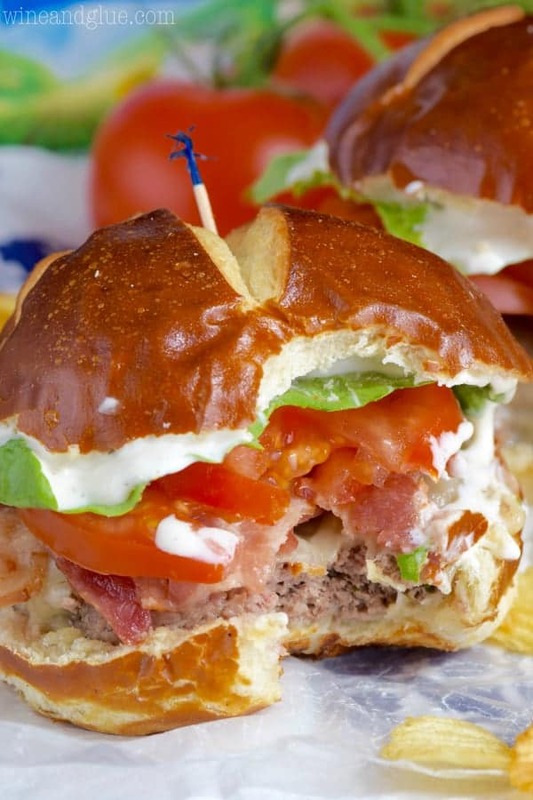 Build your burgers by first putting down the cooked patty, then the bacon, then the tomatoes, and lettuce, and finally add a tablespoon of Hidden Valley® Original Ranch® Dressing to the top piece of the bun. Be sure to visit the Hidden Valley® brand page on BlogHer.com where you can read other bloggers’ posts! I like to use it in a tuna sandwich. We love Pizza at our house, so I would use the Hidden Valley ranch on my pizza dough to make my Chicken Mozzarella tomato pizza that we love! 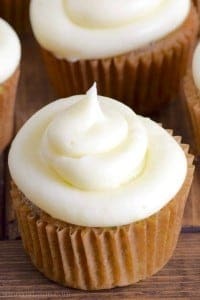 Oh these sound SO delicious!! These look amazing Lisa!! 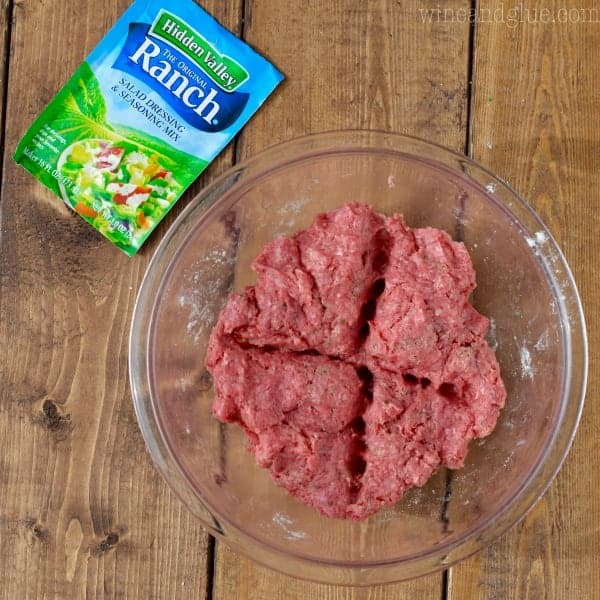 Love that you put the ranch inside the burgers, I’m totally doing that! That’s a great idea for adding extra flavor to your burgers! I’m going to try this for sure! I like to mix Hidden Valley ranch seasoning mix into my scrambled eggs. It adds lots of flavor! I like to use Hidden Valley Original Ranch salad dressing mix on roasted potatoes. This sounds delicious! I’ll try this very soon. Absolutely love the Ranch Dressing. I use it quite often as a dipping sauce (packet mixed with Mayo) my chicken nuggets, onion rings ,French fries, etc. I like to dip pizza in ranch or use it as a topping for a veggie burger. I like using it to dip my Carrots in. My favorite non-salad way to use Hidden Valley Original Ranch Dressing is to make ranch Buffalo wings. I love to make their Ranch Cauliflower mash recipe. Rally it Makes Me Hungry !!! I like to use it on pizza or to dip pizza in. we love to use Hidden Valley® Original Ranch Seasoning Mix to make Ranch Buffalo Chicken Pizza! I like to use it as dip for vegetables. It’s perfect for any buffalo chicken recipe I make. I marinate chicken with Hidden Valley and grill it. I like to use it sprinkled on potato chunks and baked in the oven. 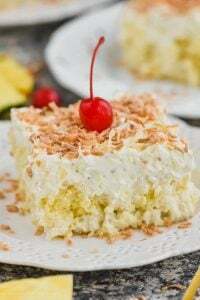 This recipe made me hungry! My favorite non-salad way to use dry Ranch is mixing it with BBQ sauce and pouring it over meatballs in the crockpot. 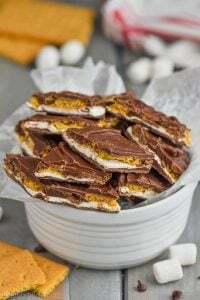 It’s so easy and tastes amazing! I have added this into meatloaf for my husband. I make the meatloaf and then he makes a sandwich out of it for a few days after at work. I use my Hidden Valley ranch dressing to marinate chicken drumstick. Always comes out moist and flavorful! I liked to use Hidden Valley Ranch mixed with bread crumbs and coat our chicken in it and bake. Thanks so much. I like to use it in chicken salad. I use it as a dip for veggies and crackers. i would love to make some sort of burger! I like the Ranch Potato Skins recipe. We use it as a dip for our chicken strips. I’ve actually mixed Hidden Valley with a bit of butter, smeared it on sweet corn and then cooked it on the grill. It was fantastic! I posted on Twitter: https://twitter.com/FireRunner2379/status/734459483347357696. I like to use it on roasted potatoes. Use it on baked potatoes with bacon and cheese! I make a taco soup that my kids really like that uses a package of ranch mix. It really adds flavor. I use hidden range all the time, meatloaf, tuna, salad I could go on and on I love it. i like to use the dressing as an alternative to red sauce on pizza. Cobb salad and ranch for me! It makes a delicious dip for sweet & spicy chicken wings! I love to make veggie pizza with it! I like to use Hidden Valley Original Ranch salad dressing mix on my roasted potatoes. My kids dip all their food in Hidden Valley ranch! I would love to use the seasoning on my homemade chex mix. I use it in my chicken marinade. I like to add Hidden Valley Ranch dressing to my hamburger. I love to use Hidden Valley Ranch to make my oven fried chicken! I mix it with onion soup mix to pour over pot roast. I like to mix it in with the flour when I make fried chicken. I like to quarter small red or yellow potatoes, spray lightly with oil and sprinkle generously with the dry ranch mix. Bake and enjoy! I like making the CRUNCHY BAKED RANCH CHICKEN from the Hidden Valley recipe collection. It’s a great baked potato topping better than sour cream! I like to use it on tacos. My Dad likes ranch dressing blended in with his mashed potatoes. We always use them when roasting potatoes in the oven! My favorite non-salad way to use Hidden Valley Original Ranch Dressing is to dip my crisp and fresh Chicken Wings. My mom used to make burgers like these growing up. Delicious!! This looks delicious. I will definitely try it this weekend. Thanks for sharing Lisa. I hope you liked them Esther!